Howey, Hugh. I, Zombie. Broad Reach Publishing, 2012. Don't like exceedingly visceral descriptions of death by zombie? Then perhaps you should give this book a miss. I decided to listen to the audio version rather than read this, thinking the vignette style would be perfect for my bit-at-a-time-while-making-dinner (etc.) listening practices, and I'm still not sure whether I was right and the audio format is best suited to the story/structure, or I did the book a disservice and would've liked it (even) more if I'd just read it like a normal person. 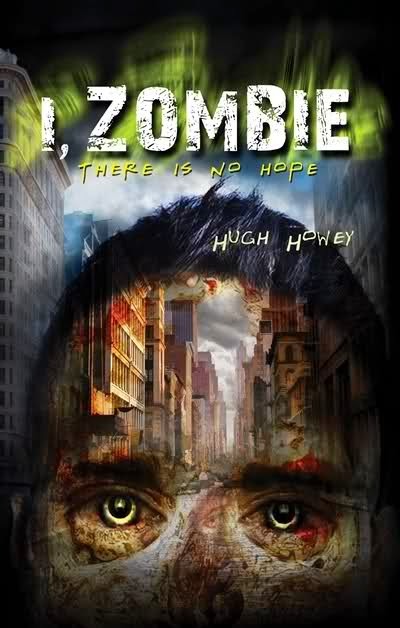 Howey presents us with quite a gory series of encounters between zombies and their (mostly) hapless victims, but with a twist that separates this tale from the vast majority of zombie stories out there: it's a zombie-eye perspective. That's right, we see the world filtered through their hunger for braaaains (and all the viscera, as it turns out). Yet that's not all—we are also treated to the horrified observations, via internal monologue, of the people these zombies used to be, aghast at what their bodies are doing. If I had to choose one song that best characterizes the strange situation these people-yet-zombies are in, it's definitely Metallica's "One" (the know the 'one', right? haha!). That's because they're definitely locked in, *almost* entirely unable to influence their zombie bodies' behavior and certainly powerless to resist the hunger for other humans. This is a curious coincidence for me personally, as the next book I will review here at Nerds of a Feather is Scalzi's "Lock In", about a very different and rather more optimistic version of locked-in syndrome. Strange as it may sound to say, this might be, despite the gore, Howey's most beautifully written book (so far). Some of the descriptions of what each zombie is doing (and what each former person thinks of these actions) are exquisite, not in the florid, yanking-on-the-heartstrings melodramatic way but with the staccato beauty of Hemingway. And parts of it, where Howey suggests the new reality these people experience being locked inside zombies might not quite be as final and irrevocable as they think, have deliciously chilling implications for human nature: if you were bitten, and then felt a very powerful urge to chomp on the hapless idiot standing next to you, of course the most appealing interpretation of the messy result would be that you had no choice, that you were powerless next to that mighty hunger...but what if, instead of being truly powerless, it was simply very difficult to resist the compulsion to snack on your neighbor—and you chose not to fight it? Howey may be hinting, here, that some of us might experience a rather smoother transition to zombiehood than we might want to believe. Despite all that recommends it, I ultimately couldn't connect with this particular story (or format) quite as well as Howey's more straightforward sci fi adventure stories like Wool or Sand (both of which we've reviewed here). Perhaps that is because of my slavish desire for a mostly sympathetic or at least tough as nails protagonist with whom I can (in my dreams!) identify, a feature that is certainly missing from this vignette-style panorama of zombiedom. Or perhaps I should've read this rather than listened to it (the endless descriptions of evisceration by teeth did get to me, I'd wager, more by listening to another human being narrating them than they would if I could just scan the page and potentially skip over the gore). Whatever the reason, for this reviewer, at least, I, Zombie, while intriguing and certainly worth reading (listening to! ), can't measure up to Howey's best work. Nerd coefficient: 7/10 "An enjoyable (if gory!) experience, but not without its flaws"
Brought to you by Zhaoyun, zompire aficionado and NoaF jedi knight (or at least Paduan apprentice, though in the interests of full disclosure, I've never even been to Padua!) since 2013.